The ringing, echo-drenched electric 12-string guitars on the debut single by Scottish rockers, The Poets, are such a striking sound for 1964 and yet a strangely familiar one: might it be possible that the band later reincarnated as Brian Jonestown Massacre? With the utmost of commitment from each and every band member, “Now We’re Thru’” is a classic A-side from top to bottom, with the chiming guitars – and particularly the lonely vocal at song’s end – ratcheting up the mystery and angst. 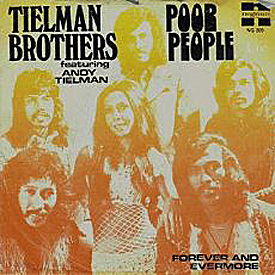 The song would find release in Japan (manufactured by the “other” King Records), as well as the US, Australia, and the UK, where the song charted at #31, doing particularly well in Scotland, confirms Unterberger in his (revised) history of ‘overlooked innovators and eccentric visionaries’ — Urban Spacemen and Wayfaring Strangers. “Bob Crewe, independent record producer, has formed his own label, Dynovox, which will be distributed by Amy-Mala Records. 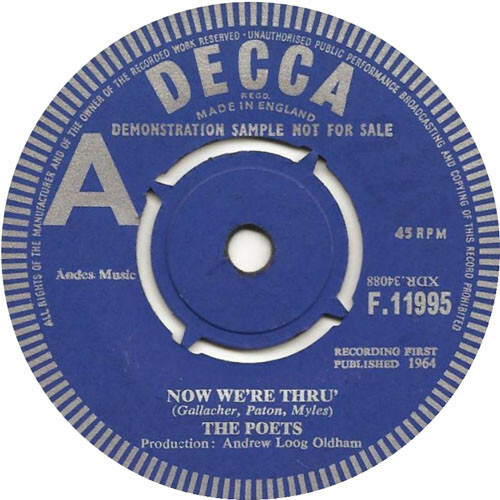 The label’s first release is ‘Now We’re Thru” by the Poets. Crewe is currently producing sides for the 4 Seasons, and current releases ‘Watch Out Sally‘ by Diane Renay on MGM; ‘Dusty‘ by the Rag Dolls on Amy-Mala; newcomer Michael Allen on MGM Records with ‘She,’ and the forthcoming Travey Dey release on Amy-Mala. 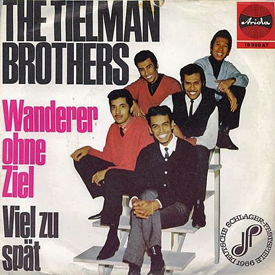 After recording two singles for Oldham’s Immediate label, The Poets would carry on for one more single after Gallacher’s departure – 1967’s “Wooden Spoon” – before disbanding. Wait a minute, 1967 is the birth year for Anton Newcombe: coincidence or musical reincarnation? The Poets would reunite in 2011 for a live performance at Glasgow’s Eyes Wide Open club. Tip of the hat (yet again) to Tom Avazian for hipping me to this track via UK anthology album from 1983: 20 One-Hit Wonders, Volume 2. 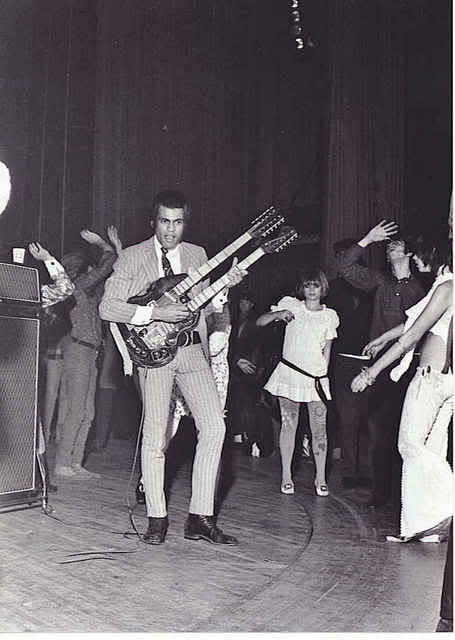 In fact, [George] Harrison’s Rickenbacker wasn’t the first electric 12-string on a British recording session. That honour belongs to a Burns guitar played by Hank Marvin of The Shadows. 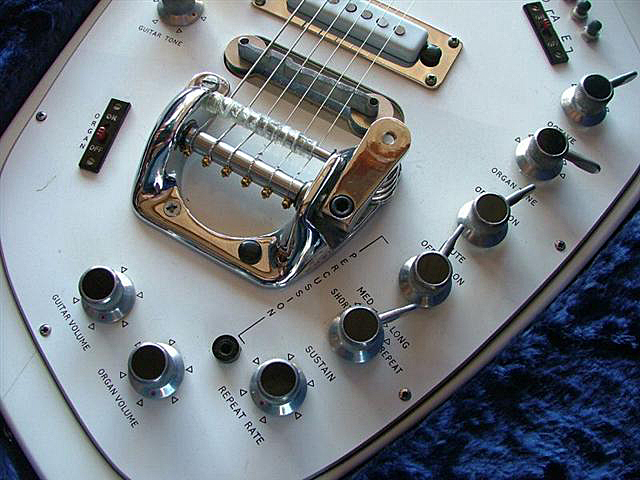 Marvin, a Fender Stratocaster player, had teamed up with British guitar-maker, Jim Burns, to design a new solid-body six-string electric. 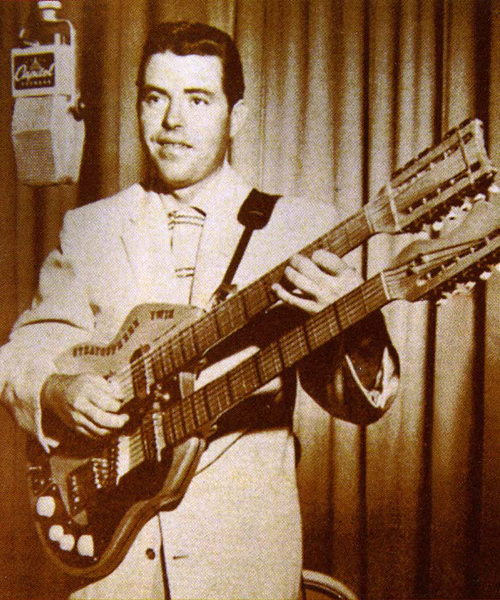 Burns also came up with an electric 12-string, and around October, 1963, Marvin received an early sample of the Burns Double Six. He took it along to various sessions at EMI’s Abbey Road studios in London where he was recording with Cliff Richard & The Shadows. Marvin intended to record “Don’t Talk to Him” using the Burns 12, but problems arose, so instead he doubled a six-string line to achieve the prominent hookline. 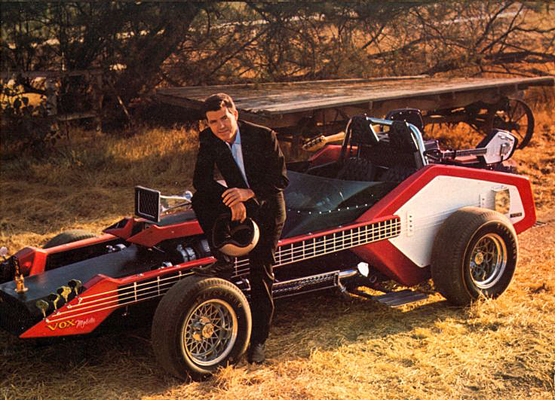 A few weeks later, however, he recorded another Cliff session and played the prototype Burns 12-string for “On The Beach.” Unusually, the 12 was strung like a six-string bass plus octave strings, clearly heard on the song’s low-down double string runs. Later in November, Marvin used the Burns 12 with regular stringing for “I’m the Lonely One.” These Cliff Richard songs weren’t released until 1964 — in the UK singles chart, “I’m the Lonely One” went to Number 8 in February and “On the Beach” to 7 in July — but they are important as early British recordings of the electric 12-string sound. 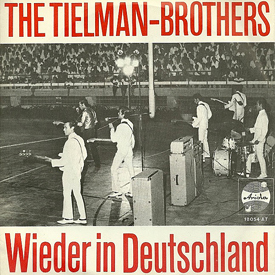 The very first release of a British record with electric 12-string — just ahead of The Beatles and well ahead of Cliff & The Shads — was the result of another Abbey Road session. Paul McCartney gave one of his songs to Peter & Gordon, a new duo signed to EMI. 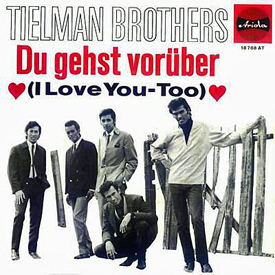 They recorded their single “A World Without Love” at Abbey Road in January 1964, with sessionman Vic Flick [of James Bond theme fame] on guitar. Wait a dagblasted second! How come I never heard of Dave Bunker or stumbled across his radical 1950s “Duo-Lectar” in all my musical readings until just now? 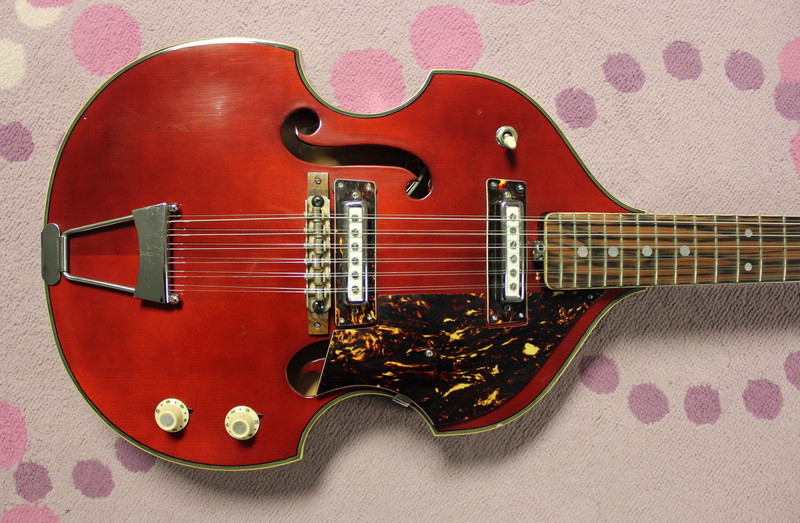 “In 1958, Bunker patented the guitar as the Duo-Lectar and subsequently showed it at NAMM when the show was still held in Chicago’s Palmer House hotel. He recalls sharing space at the Standel amps booth with a young Barbara Mandrell and entertaining guitar greats like Chet Atkins, Mel Bay and Joe Maphis with his Duo-Lectar. It is particularly intriguing to see Denney – the instrument’s co-designer (who appears around the 6:30 mark) – show off the instrument’s “live looping” feature that allows the musician to sample & repeat a musical riff and then improvise melody lines on top of this looped musical accompaniment — a special capability that would only become accessible to the consumer market 30 years later (i.e., “one-man digital bands”). 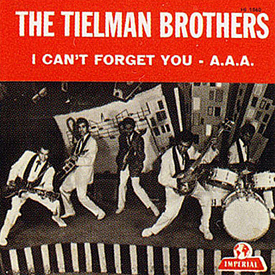 Andy Tielman and his brothers Reggy, Ponthon, and Loulou would emigrate to the Netherlands in 1957 and get their first big gig at the 1958 Brussels World’s Fair in the “Hawaiian Village” of the Dutch pavilion, where they stole the show (see live performance clip above) with their exuberant stage antics, according to Indo-Rock-Gallery. 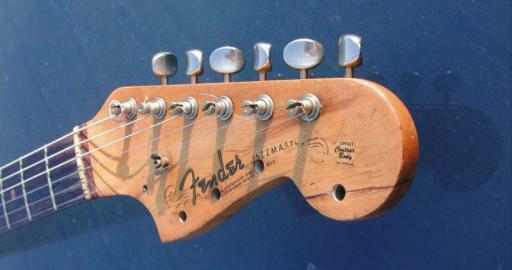 Andy Tielman’s famous 10-string Fender Jazzmaster was a result of having switched from his original Gibson Les Paul (due to its weight) and finding the Fender sound too thin. 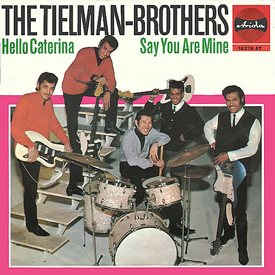 Tielman, therefore, doubled each string (except the highest and lowest ones) and tuned every string pair in octaves to enlarge the sound. 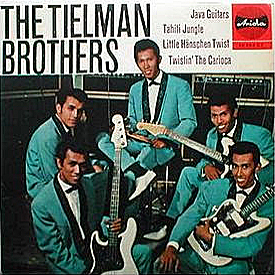 At the time, Tielman tried to conceal his instrument’s headstock with a towel, but other bands would copy his invention. Even still, I can find no photos of Andy’s 10-string invention on the web. Bakker also points out how the output from bassist, Robby Latuperisa, was “plugged through Andy’s guitar signal” on the way to “all other Fender Bassman and Showman” amplifiers, in addition to the PA sound system. Rock-It-Chain has band member lineups over the years, as well as a detailed discography. 1. “Stratosphere Boogie” by Speedy West & Jimmy Bryant: phenomenal, blazing twin guitar work – rock and roll by any other name (although some might call it “hillbilly jazz“). 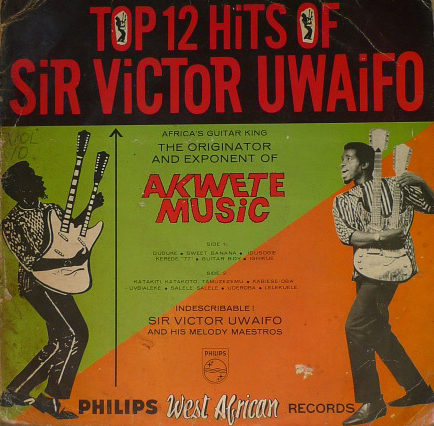 Recorded September 2, 1954. Bryant is using a “Stratosphere Twin” double-neck guitar with 6-string and 12-string necks. The 12-string neck, curiously, is tuned in thirds, thus sounding like twin lead guitars playing lines in harmony. 2. 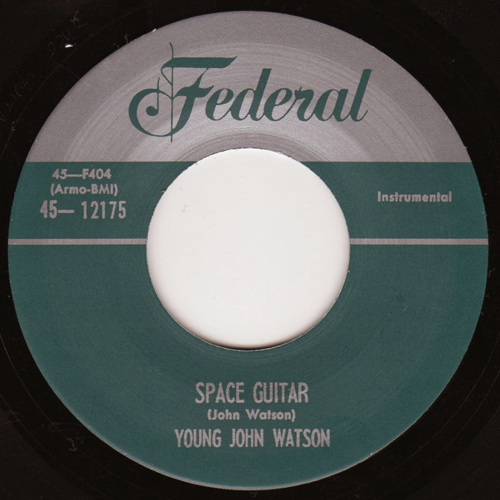 “Space Guitar” by Johnny ‘Guitar‘ Watson: unhinged guitar paired with playful production (and unpredictable reverb) – as Larry Nager so adroitly dubbed it, “punk blues.” Recorded as ‘Young John Watson’ in Los Angeles on February 1, 1954 and released on Syd Nathan‘s Federal Records. 3. “Pork Chop Stomp” by Grady Martin and His Wingin‘ Strings – crisp production, great chops (so to speak) and a little humor go a long way. 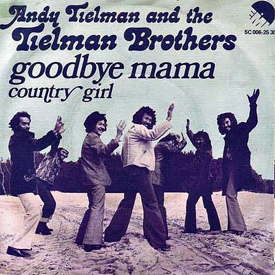 That’s Bud Isaacs on pedal steel, with Grady Martin and Hank Garland both playing lead on this spirited piece of western swing – recorded January 13, 1954.